January | 2011 | Linden Optometry A P.C. Enter to win a pair of Juicy Couture or Carrera Sunglasses! The newest eyewear fashions for 2011 will be on display at Linden Optometry in Pasadena. Linden Optometry P.C. 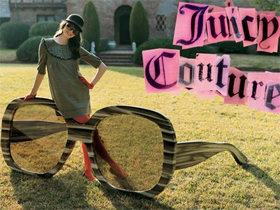 will host a Juicy Couture and Carrera Eyewear Trunk Show on Saturday January 8th, 10:00 AM to 5:30 PM, featuring the newest Designer Eyewear and Sunglasses for 2011. Shoppers are invited to stop in and try on over 10,000 styles and colors of Eyewear from dozens of designers. Fashion Consultants will be on hand to help you select the eyewear that brings out the best in you! Enter to WIN a Free Pair of JUICY COUTURE or CARRERA SUNGLASSES! (includes non-prescription sunglass lenses; total value up to $200). Juicy Couture sunglasses have captured the hearts of young fashionistas with their modern collection of ultra-chic styles. Featuring over-sized frames with rhinestone embellishments and fun Juicy logos, Juicy Couture sunglasses are the future of fashion. Who’s wearing JUICY? We have spotted three celebrities wearing Juicy Couture Sunglasses in recent news photos. They are recording artist Britney Spears, actress Katherine Heigl, and politician, author, speaker, and political news commentator Sarah Palin. For the last half century, Carrera has been designing sports eye wear for world famous athletes. The innovations made by the company shaped the future of sports sunglasses, as we know it today. Carrera Sunglasses features vintage designs from the 1970s and the 1980s which have influenced much of the industry’s current styles. The new collection of Carrera Sunglasses bring forward polarized lenses, memory metals and lightweight plastics. Refreshments will be served at the trunk show. Free Parking in the rear of the building.